Off for our first overnight cruise on Argon just for fun. The last time we sailed overnight was on a pretty unpleasant long cold wet trip home from Barrington, RI where she was commissioned. This time, the only agenda was to sail up to Salem and relax overnight. Nothing very eventful to report on the way up. The wind was moderate and we had to do a few big tacks to make the entrance to Salem Harbor. Once there, we had visitors come out on the Marblehead launch to hang out onboard with us. 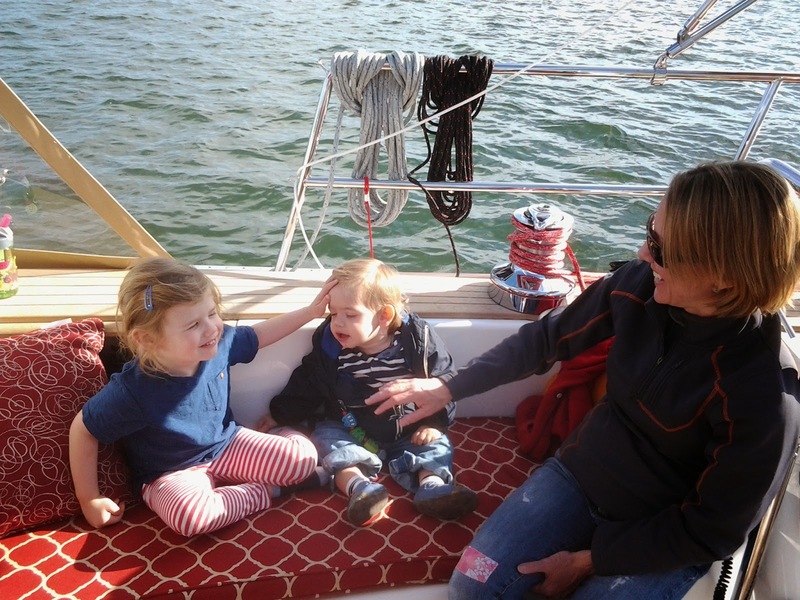 Our friend Jil and her two little ones came aboard for some snacks and to be cute. Later on, we took the salem water taxi launch into town to meet with our friends who are from our marina and also sailed up that day. 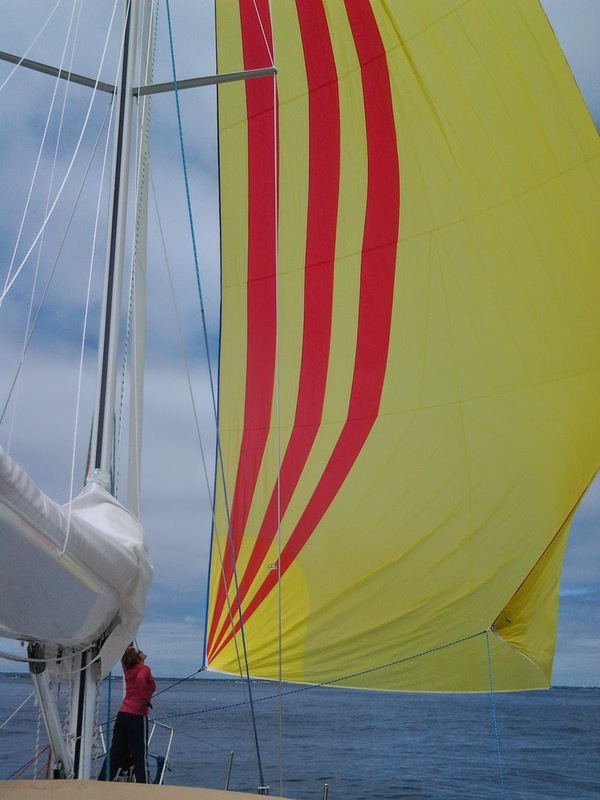 My Christmas Present for Argon was a nice new asymmetrical spinnaker from Doyle Sails. Unfortunately, the sail wasn't finished until April but hey - it's Christmas somewhere right? No? Anyway, we have not flown a spinnaker of any kind since our classes at BSC years ago. And we have never flown an asym. But it was a light wind day so we figured we would test it out. 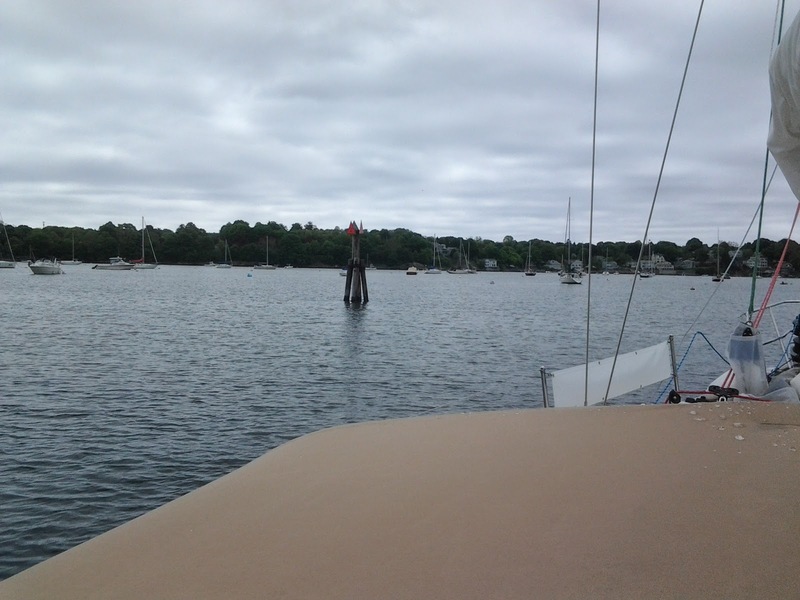 When we left Salem harbor, we headed due south for a few miles to give us some room to play. Finally we turned north (directly downwind) and started fumbling with the asym. Hey it worked! We got moving up to 5kts in only 8kts of wind from behind us.